Tru-Flo actuators feature a bi-directional travel stop (International Patent). Side located stops allow a ± 10° stroke registration. Travel stops are designed to absorb the maximum rated torque of the actuator and the maximum impact load associated with recommended speed stroke.To increase pistons resistance both travel stops arrest the pistons in their part with the largest mass of material. Adjustment of the counter clockwise and clockwise rotation is accomplished by turning the respective left (MAX) and right stop (0°) adjustment screws to increase or reduce output rotation. 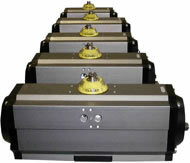 The Tru-Flo rack & pinion pneumatic actuator produces linear torque output in a compact design utilizing the same body and end caps for double acting and spring return units. The standard angle of rotation is 90°. Additional travel rotations of 120°, 135°, 150° and 180° are available. UT16 and upper sizes feature a travel stop with ± 10° stroke registration. Tru-Flo, secures a captive pinion (anti-blowout system) and permits flexibility in mounting by retaining AISI 304 nuts (standard) or AISI 304 bolts (optional) in either dual ISO patterns, or to customer dimensions. Shaft bearings isolate the pinion gear from the housing and support the shaft for high cycle applications. Many competitive manufacturers do not provide this critical feature. The pinion teeth are engaged the full length and stroke of the piston. The pinion height allows manual override without disturbing the indicated positions. External open/close indicator as standard, available for all the rotations. Epoxy coated special steel springs are pre-loaded with non-metallic materials. The stainless steel end cap fasteners are extra long to allow for spring relaxation. All parts are corrosion resistant. Air pressure operation from 2 to 10 Bar (40 – 150 PSI). Water, nitrogen and compatible hydraulic fluids may also be used to power the actuator. Extruded aluminum body is internally machined and lapped to exact specifications. Honing prevents dry spots from forming within the actuator bore and therefore eliminates premature seal failure – a critical aspect to long cycle life. All internal and external surfaces are hard anodized for corrosion resistance, with all units permanently lubricated at the factory with non-silicone grease.